Watch the film produced and shown as part of the 1001 Inventions touring exhibition starring Sir Ben Kingsley. 1001 Inventions is a unique UK based educational project that reveals the rich heritage that the Muslim community share with other communities across the World. The award winning 1001 Inventions exhibit held at the National Geographic Museum reveals the ancient Muslim world’s groundbreaking contributions to the science and technology arena and how its influence extends into the present day. What do water fountains, rocket jet packs, and graduation robes all have in common? Emeritus Professor Salim T.S. Al-Hassani reveals the enduring legacy of Muslim civilization. Emir of Qatar, His Highness Sheikh Hamad bin Khalifa Al Thani, visited the award-winning 1001 Inventions show in Doha today, accompanied by HH Sheikha Al-Mayassa, Chairman of the Board of Trustees of the Qatar Museums Authority. The latest 1001 Inventions exhibition, and the first designed specifically for a Middle East audience, enjoyed a glamorous Royal launch in the UAE’s capital. 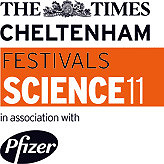 This event was part of the Cheltenham Science Festival and took place on the 12th of June 2011, in Cheltenham, Gloucestershire. The 1001 Inventions exhibition at California Science Center was featured on Southern California’s NBC4 channel, a programme with Conan Nolan. The 'Arabick Roots' exhibition was launched at the Royal Society in London on the 9th of February 2011 by HH Sheikha Mozah of Qatar. U.S Secretary of State, Hillary Clinton launches the '1001 Inventions' touring exhibition at California Science Center in Los Angeles. Imagine a world without them? Coffee, computers and piston engines - could we imagine a world without them? VOA's Sonja Pace reports from the British capital. ‘Interfaith Dialog Between Civilisations’ conference at the United Nations in New York, 12th November 2008. Find out some of the every day items in our schools that came to us through a shared heritage with Muslim Civilisation. Al-Jazari's 800 year old automatic Elephant clock using water technology. An example of the Muslim origins of modern automation and robotics. Find out some of the items in our hospitals that came to us through a shared heritage with Muslim Civilisation. Muslim contributions to modern engineering and the birth of automation. Find out some of the every day items in our homes that came to us through a shared heritage with Muslim Civilisation. See al-Jazari's water powered scribe clock brought back to life after 800 years. British scientist, author and a broadcaster. Professor of Theoretical Physics at the University of Surrey. The School of Oriental and African Studies (SOAS), University of London Lecture (Run Time: 64:18) and his other lectures. Along with Christianity, the Dark Ages saw the emergence of another vital religion - Islam. After emerging in the near East it spread across North Africa and into Europe, bringing its unique artistic style with it. Waldemar Januszczak examines the early artistic explorations of the first people in Muslim Civilisation, the development of their mosques and their scientific achievements. This was also the Golden Age of Islam. And the knowledge of ancient civilisations from India, Persia and Greece were built upon by Islamic scholars in Baghdad's House of Wisdom. The art critic and art lover, Waldemar Januszczak, sets out on an epic journey of discovery across the Muslim world from Central Asia, to the heart of the Middle East and beyond to reveal a world of awe-inspiring architecture, spectacular Islamic treasures and a host of artists and craftsmen – to bring the largely unknown and fascinating story of Islamic art and architecture to the attention of the British public. Terry Moore: Why is 'x' the unknown? Dr. Adam John Hart-Davis builds and tests some of the most extraordinary inventions from the early Islamic World. Historian Bettany Hughes traces the story of the mysterious and misunderstood Moors, the Islamic society that ruled in Spain for 700 years. British scientist Prof. Jim Al-Khalili travels from Spain to Syria to tell the story of the great leap in scientific knowledge that took place in the Islamic world between the 8th and 14th centuries. A Time Team special as part of the On the Line season. A Muslim port is revealed under this modern-day Spanish town. Prof. Marcus du Sautoy he looks at the invention of the new language of algebra and the spread of Eastern knowledge to the West through mathematicians. Narrated by Sir Ben Kingsley, A three-part series, re-creates the spectacular sweep of Islamic power and faith during its first 1,000 years. Rageh Omaar uncovers the hidden story of Europe's Islamic past and looks back to a Golden Age when European civilisation was enriched by Islamic learning. Art historian Andrew Graham-Dixon travels from southern to northern Spain to tell the story of some of Europe's most exciting and vital art. An epic journey back into a centuries-long period when Muslims, Christians and Jews inhabited the same far corner of Western Europe and thrived.